When I was in college, I had a professor who was known for being a bit odd. Although he was smart, friendly, and much loved by the students, he had some strange and inexplicable habits. For one thing, he had a very peculiar way of speaking, including about a dozen idiosyncratic phrases that he repeated over and over. A friend and I, when we got bored, used to sit in the back of the classroom and keep a tally of how many times he used each of these phrases. The professor always kept a pen clipped to his collar, even if he was wearing a shirt with a pocket (a practice that amused me so much I adopted it myself—and keep it up to this day). And he encouraged us, on multiple-choice exams, to write in our own answers in the margin if we didn’t like any of his. Every now and then, this professor came to class with the sticker from a banana on his shirt. The brand varied, but the position did not: it was stuck right above the spot where his pen would be, if he had kept it in his pocket the way normal people do. We assumed it was just another one of his silly habits, but one day, a student actually asked him—during class—what was with the stickers. He replied, solemnly, “Oh. Yeah. Well, whenever I have a banana for breakfast that has a sticker on it, I put the sticker on my shirt to remind me of the suffering of the banana pickers in Latin America, who sometimes earn just 50¢ for a 12-hour day of work in grueling conditions. I wear it to show my solidarity with them, as a silent protest for better treatment.” From that day on, we saw the professor in a completely new light—and we started thinking about bananas differently too. As I was later to discover, almost nothing about bananas is as it seems. On a trip to Costa Rica, which is a major exporter of bananas, I saw endless banana plantations and also visited a botanical garden where a botanist shared some fascinating details about banana trees. He said there are about 300 varieties of banana (and their close relative the plantain—pronounced “PLANT-en,” not “plan-TAIN,” by the way), of which only some are edible, and an even smaller fraction cultivated commercially. The type of banana grown most often in Costa Rica is a hybrid that is larger and sweeter than its naturally occurring ancestors. Among the other interesting tidbits we learned was that banana “trees” are not even trees—they’re the world’s largest perennial herbs. The distinction is not merely academic; the stems, which may appear to be solid trunks, are simply multiple layers of very large leaves that could be cut through with a regular knife. In fact, the stems often break under the weight of the bananas and need to be supported with poles. Also surprising was that bananas grow upside down, seemingly showing contempt for gravity. Each plant has a flower shoot that produces a single bunch of bananas—by “bunch,” I mean a set of about 15 subgroups called hands, for a grand total of about 200 banana “fingers.” On commercial banana plantations, each plant’s bunch is usually covered with a large plastic bag saturated with pesticides, to ward off both insects and birds. Bananas also have an unusual life cycle. Normally, the primary reason for a plant to bear any sort of fruit in the first place is to propagate itself, since the fruit contains the seed. Modern, commercial strains of banana don’t have seeds. (Well, they do, but they’re tiny and sterile, unlike wild and often inedible varieties of bananas, which have large and viable seeds.) Seedless fruit-bearing plants (think of navel oranges) normally propagate only with human help—as in transplanting cuttings—because the plant has no natural way to regenerate when it dies. Here again, bananas break the mold. 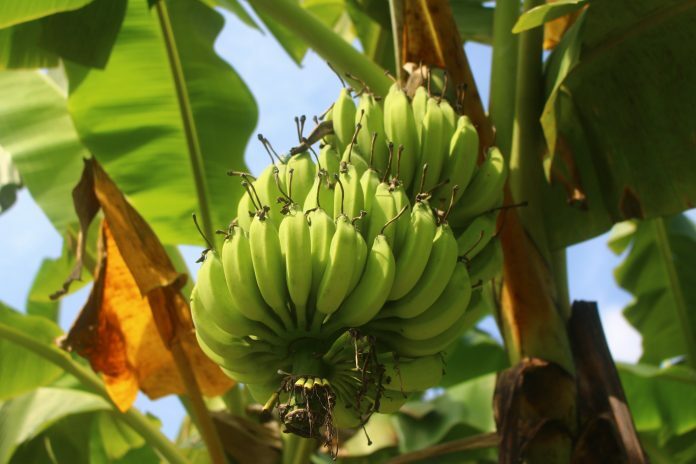 Each banana plant produces just one bunch of fruit over its lifetime of about a year and then dies—or at least appears to. But the stem above ground is just a portion of the plant, the so-called pseudostem. There is also an underground stem, called a rhizome, which produces new shoots at the base of the visible stem. These begin growing into new, flowering stems just as the old one is dying. The new plant, then, really isn’t new at all, and is genetically identical to its predecessor. These peculiarities aside, bananas are an excellent source of potassium, not to mention a highly effective device for keeping scoops of ice cream aligned in a dish. Bananas have been referred to as “the world’s most popular fruit,” “the world’s most popular tropical fruit,” “America’s most popular (or second- or third-most popular) fruit,” and a variety of other designations in the upper strata of fruit stardom, based on different metrics for assessing popularity. In any case, Americans—and much of the rest of the world—certainly consume immense quantities of bananas. But what about the tale of the exploited banana pickers? I’m sorry to say it’s true. Though the situation is better in some areas than others, and has on the whole improved somewhat since I was in college (for example, fair trade bananas are a thing, at least in some areas), the life of the average banana picker is still rather bleak. Of course, if the producers paid their workers a living wage, bananas would become so expensive that few people would buy them, thus reducing demand, and so on—a tricky problem to solve. For my part, I wear banana stickers just as my professor did—not to advertise Dole, Chiquita, or Del Monte or because I think it will have any tangible impact, but to remind myself of the real price of bananas. Note: This is an updated version of an article that originally appeared on Interesting Thing of the Day on June 15, 2003, and again in a slightly revised form on August 30, 2004.